No selling. No jargon. 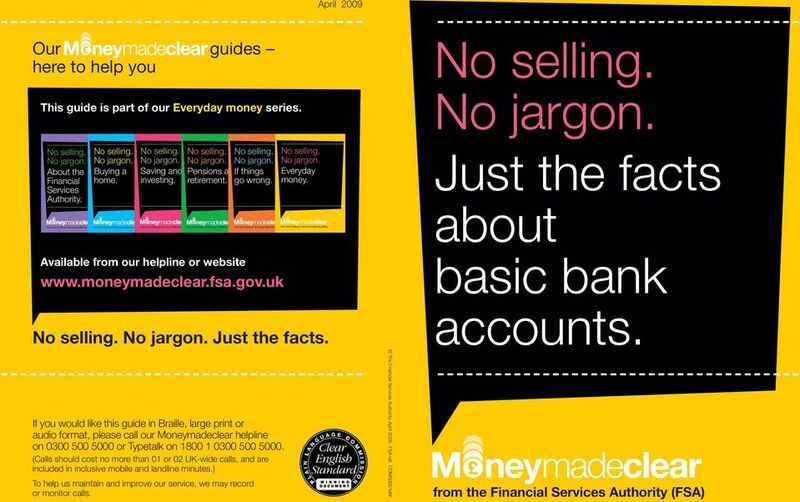 Just the facts about basic bank accounts. Our guides here to help you. No selling. No jargon. Just the facts. Download "No selling. No jargon. 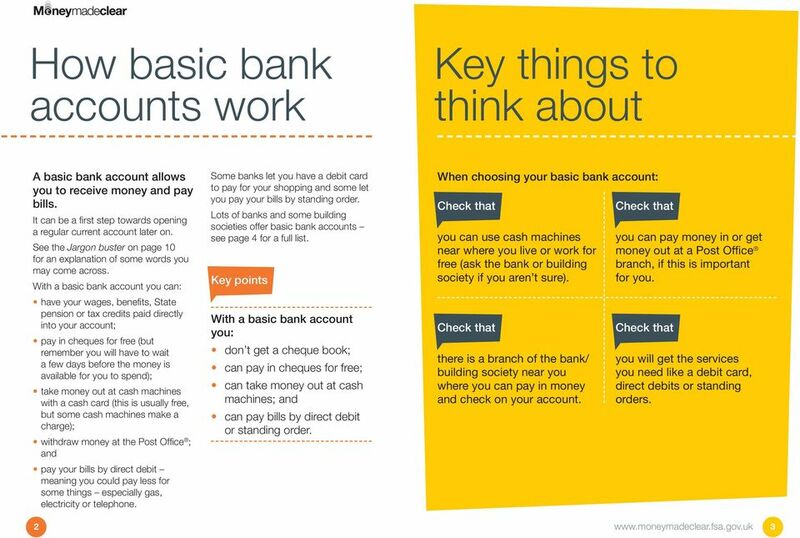 Just the facts about basic bank accounts. Our guides here to help you. No selling. No jargon. Just the facts." 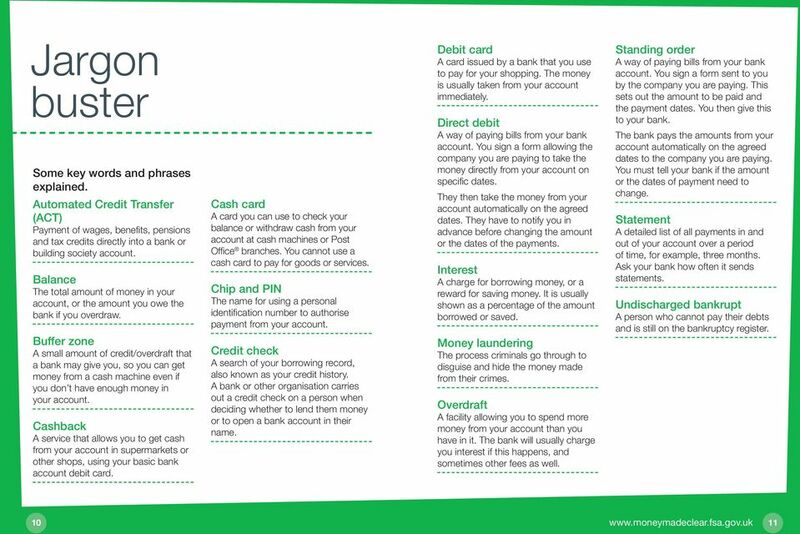 Just the facts about basic bank accounts. August 2008 Our guides here to help you This guide is part of our Everyday money series. About the Financial Services Authority. Buying a home. Saving Pensions and andpensions andif things investing. retirement. May 2008 Our guides here to help you This guide is part of our Everyday money series. About the Financial Services Authority. Buying a home. Saving Pensions and andpensions andif things investing. retirement. July 2007 Our guides here to help you This guide is part of our Everyday money series. About the Financial Services Authority. Buying a home. Saving Pensions and andpensions andif things investing. retirement. 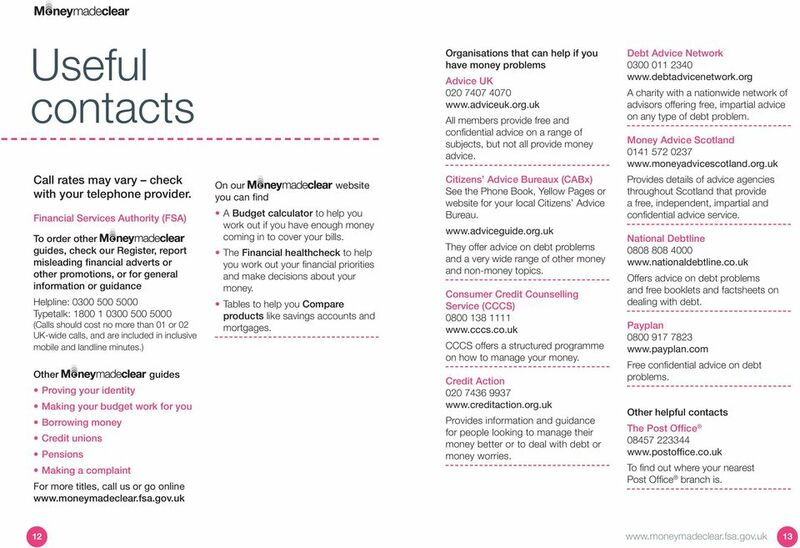 The Money Advice Service is here to help you manage your money better. We provide clear, unbiased advice to help you make informed choices. Local Housing Allowance. How will I be paid? No selling. No jargon. Just the facts about credit unions. No selling. No jargon. Just the facts about credit cards. guides. Our here to help you. No selling. No jargon. Just the facts. No selling. No jargon. Just the facts about borrowing money. Our guides here to help you. No selling. No jargon. Just the facts. No selling. No jargon. Just the facts about proving your identity. Our guides here to help you. No selling. No jargon. Just the facts. Opening a Bank Account. Information on different types of accounts and what they offer. Just the facts about. Moneymadeclear. Our guides here to help you. No selling. No jargon. Just the facts. www.moneymadeclear.fsa.gov. 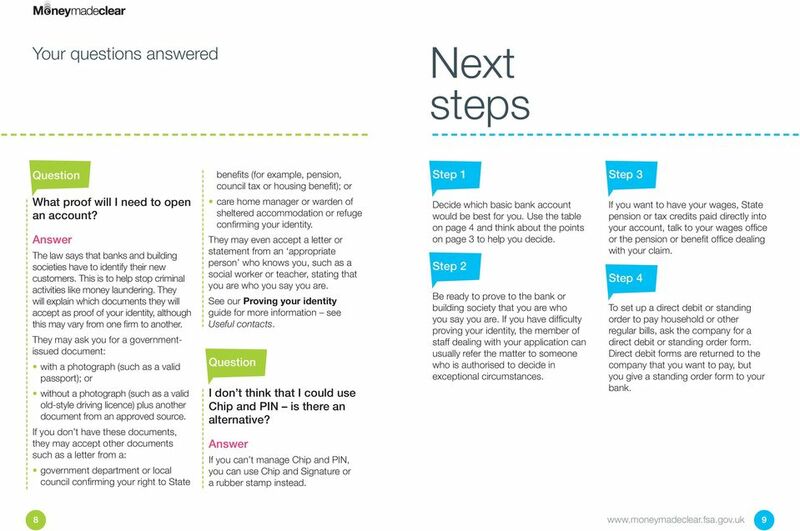 Southend-on-Sea Borough Council Department for Corporate Services Revenues & Benefits Service A Guide to Basic Bank s What is a Basic Bank Basic Bank accounts are available to everyone from most banks. May 2009 Our guides here to help you This guide is part of our Buying a home series. About the Financial Services Authority. Pensions andeveryday retirement. money. Saving and investing. If things go wrong. Just the facts about making your budget work for you. December 2007 Our guides here to help you This guide is part of our Everyday money series. About the Financial Services Authority. Buying a home. Saving Pensions and andpensions andif things investing. 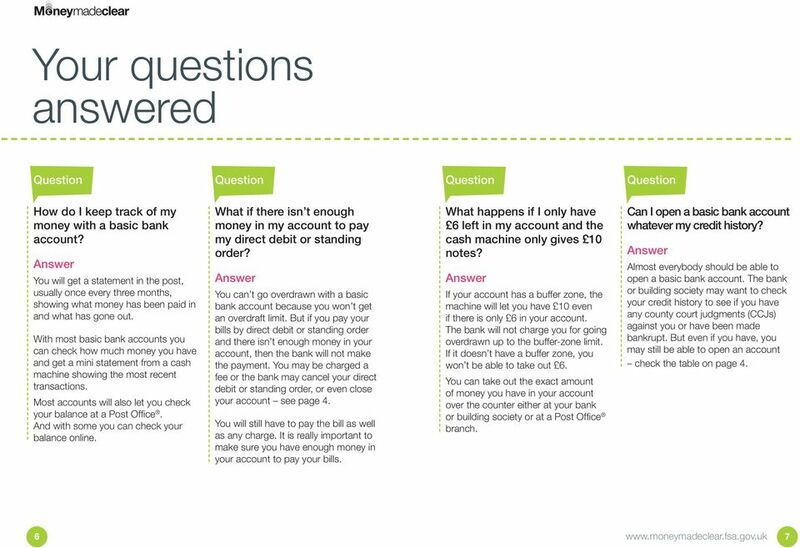 BANK ACCOUNTS HOW MUCH DO YOU KNOW? You can afford your mortgage now, but what if...? Self-directed support Opening a bank account If you have a personal or individual budget you will need a separate bank account. Opening a bank account can be complicated. This explains how to open an account. Can t Pay Your Mortgage? 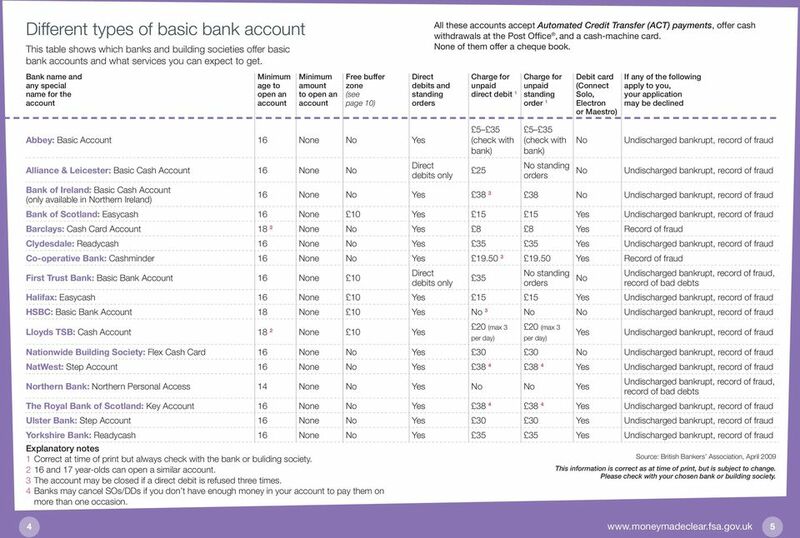 Current Accounts User Guide. 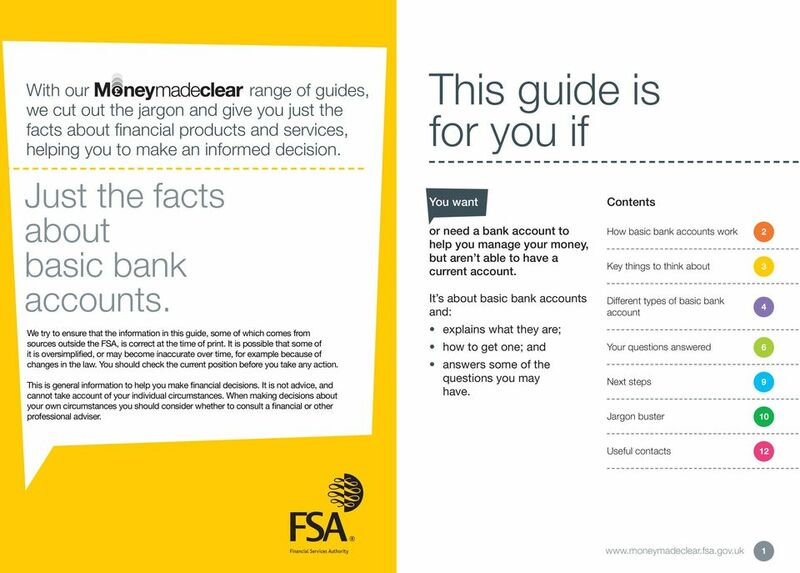 Information to help you make the most of your current account. Just the facts about home purchase plans. Debt. Essentials. We can t tell you everything in these few pages but it should help you see that there are options.